It is noted that Indian government policies on the codification of personal laws continued to conform closely to those of the British colonial government. The British colonial government sought to reform and codify Hindu personal law for reasons of administrative and judicial clarity and convenience. 4. Codification in India happened during the time of British because following creation of Napoleonic code, it became a fad to codify laws. India became a testing ground for codification of laws. Experiences from India could be applied elsewhere. Our experience under the British rule showed us that religion and politics needed to be treated as separate. Any time state was seen to be interfering in religious affairs, it united the people. Post independence, Ambedkar had prepared a comprehensive code codifying all personal laws. However political will to codify personal laws, it was felt, would hurt the religious sentiments of the people. Mahatma Gandhi had realized that people of India were deeply religious and that sentiment ought to be respected. Hence the unwillingness to codify all personal laws in a single sweep. Also, post independence the nation was undergoing a phase of consolidation. It was felt that in this backdrop, codifying all personal laws would generate discontentment, a risk that the government was unwilling to take. Even today the debate over Uniform Civil Code continues to polarize the society. Despite being one of the Directives in Part V of Constitution, the issue is seen from a communal angle. This ignores the rights of women which are getting affected in the absence of uniform code. 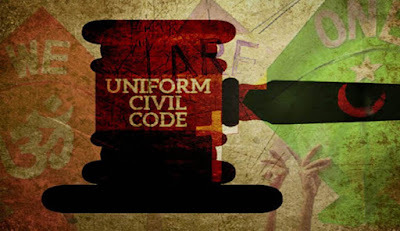 Court has come out several times and said that India requires a UCC. It is now upto the parliament to fulfill the directives of Indian Constitution.